Have you ever heard of the Vermont Alps? Yes, it sounds strange. But, think of the scenery from that movie The Sounds of Music - open pastures with views, green hills with well-worn paths up where dairy cows come to meet you at the fence and places where you want to spin around in a ridiculously dizzying manner. Maybe you just want to jump on your horse and gallop down dirt roads through an arbor of Maple trees. No billboards, no skyscrapers, just the fresh air, land and sky. The place for all this is Reading, Vermont. For horse lovers, Reading (pronounced Red-ding) also happens to border two equestrian capitals of the region, South Woodstock and West Windsor. The small community, located between Woodstock and Springfield, does not call attention to itself. There is nothing fancy here. Its center is a “hollow" with plenty of wide-open acreage rising up into its alp-like pastures that continue to Tyson and a small lake-country due West towards Ludlow. The population of Reading is approximately 700 year-round residents who live on old Vermont family farms, down dirt roads or on the simple main street (Rt. 106) with its town hall, churches, an elementary school, a greenhouse and a general store. Yet, within its simple borders, in the shadow of Mt. 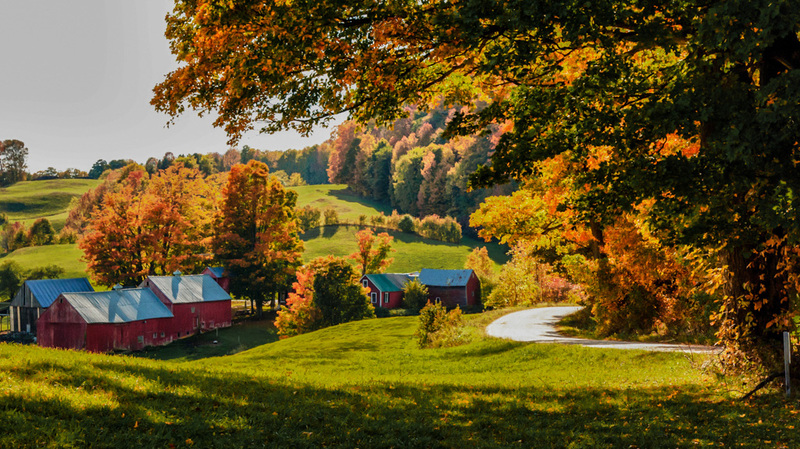 Ascutney on one side of the Valley and the “Alps” on the other, you’ll find one of Vermont’s best swimming holes, known as Twenty Foot Hole, not to mention the surprising location of one well-known financier’s farmstead and exceptional collection of modern art. Andrew Hall, of late, has made quite an impact on the community establishing his Newhall Farm with its many farm-to-table products and rotating art exhibits within a refurbished barn (Hall Art Foundation). 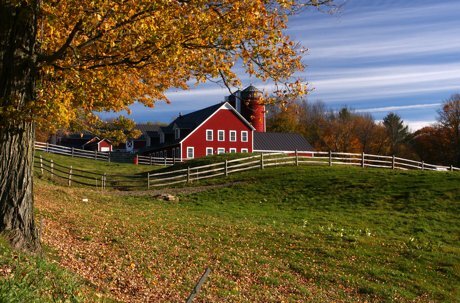 But even those without big names or large wallets are here in Reading quietly creating artisan cheeses or growing vegetables, selling their Vermont wares far and wide. In March, the steam still rises from maple sugar houses in Reading as the sap oozes out of trees and residents prepare for various spring and summer activities – a major Fourth of July parade, a strawberry supper. Those who live in Reading year-round have found a place to call home easily within commuting distance to Woodstock and other Upper Valley locations, working at the National Park or the Woodstock Inn and Resort. Nearby Mt. Ascutney Hospital in Windsor is both a medical provider and a local employer. For winter sports, Reading is within reach of Okemo and Killington and easy to get to from either Boston or New York City via Interstate 89 or 91. Lebanon, New Hampshire Municipal Airport provides connection to Boston Logan and LaGuardia Airports. Hartford, Connecticut is just two hours away. Reading is also a must-go destination for any number of summer athletic events due to its incredible beauty and its rolling, but challenging hills. 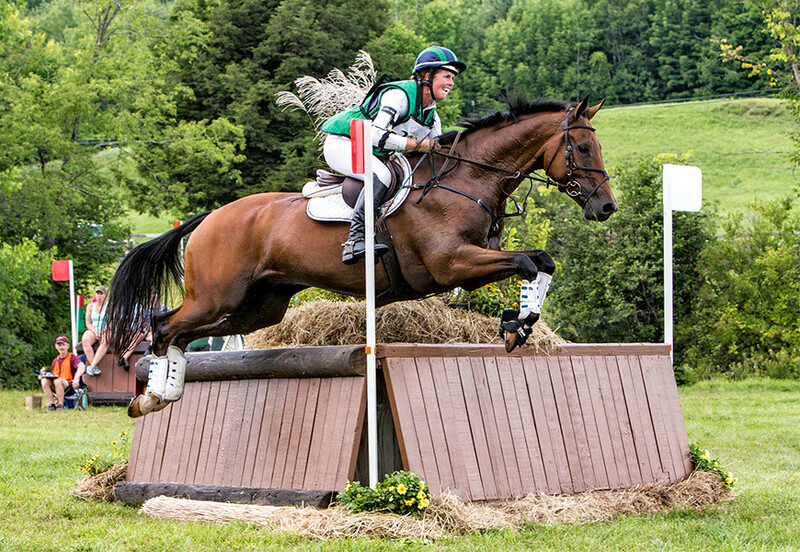 The community hosts participants in the Vermont 100 ultra-marathon, 50K mountain bike races and multiple weekend equestrian trail rides sponsored by the nearby Green Mountain Horse Association. Whether you’re looking for a place to keep horses, raise a family, retire or just enjoy weekends in the country, Reading offers magnificent possibilities in an un-fussy and private atmosphere. And while the location is rural, you can still find places to dine out by taking a little drive to Keepers, The Kedron Valley Inn, The Hartland Diner or The Skunk Hollow Tavern. Don’t forget the ice cream stand just south of Reading at a place called Downer’s Corners. After a swim in your pond or at that secret swimming hole on a hot day, you might find yourself there, sitting on a bench watching the world go by, any pent-up stress dripping away like your delicious maple walnut ice cream cone. You might even be tempted to turn off your phone. We won’t tell.